Having interviewed Max Wu with Vinci a couple of times already for their 1st generation headphones, we knew it was a must to stop-in and say hello when we saw him in Eureka Park this year at CES 2018. We loved their headphones that debuted last year, which were the first in the world to incorporate standalone voice command. 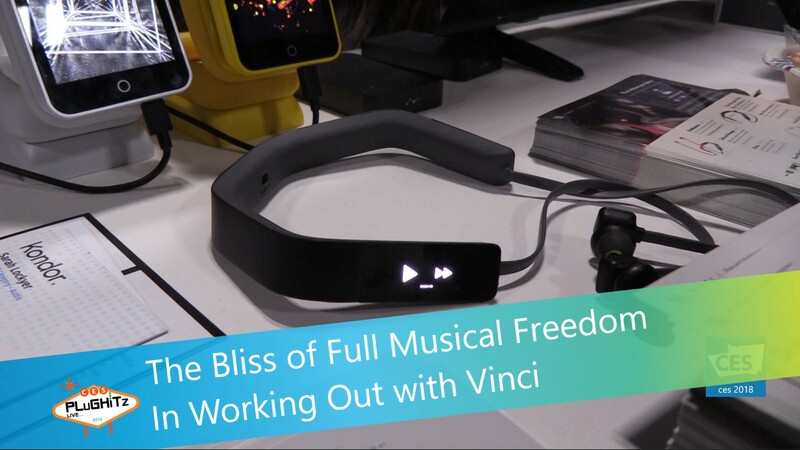 They allow users to take them on the go and pull up their favorite music without having to reach for a cell phone. So we were really excited to see what's new. They did not disappoint. This year they are even more geared towards sports and working out with Vinci 2.0 Earbuds. They have added all of the functionality of the headphones into a much smaller form. These earbuds only weigh 80 grams, fit comfortably on the neck and in-ear and offer all of your music without the need to even have your phone on you. So you will be able to go out jogging and be able to listen to your tunes as well as take phone calls without having to lug around that bulky phone, which is great since lots of workout gear don't have pockets. Setup is simple and also the only time that you need to use your phone along with them. The app will take you through adding (or changing) your favorite music streaming services and libraries. From there, these 3G, Wi-Fi and Bluetooth earbuds will automatically synch with your phone when they are together, to keep all of your information up-to-date. And don't worry, it doesn't only synch up your music, but it also gathers your health stats and adds them to the health centers in you Apple and Android phones. Classic to Vinci, there is still a screen, but it is much smaller and designed to blend in to the aesthetic. It is definitely a more passive system for power preservation, but you can still customize it to your preferences. The screen makes it easy to check the on/off status, battery life and signal strength. The battery will last for up to 14 hours of continuous play and it comes with a USB docking station that will give a full charge in about 2.5 hours. The Kickstarter for Vinci 2.0 recently ended and they should start shipping in Feb 2018. Pricing starts at $89 for 8GB and goes up to $249 for the 32GB. Check out all four colors and choose a pair of your own on their website. You can also pick up a pair of the full size headphones on Amazon.